First edition of the new model. no lights, Old style shocks, Bendix. It all depends whether you are buying or selling! If you are buying, then "it's not original"...or if you are selling, then "prove it's not" original! ...right George? That is how I learned it! Looks like the Bonanza is up on ebay again and it looks really nice. The e code engine for one. If it wasn't restored you can look and see if it had marks where the hodaka engine plate mounted. You can't tell from the serial number. 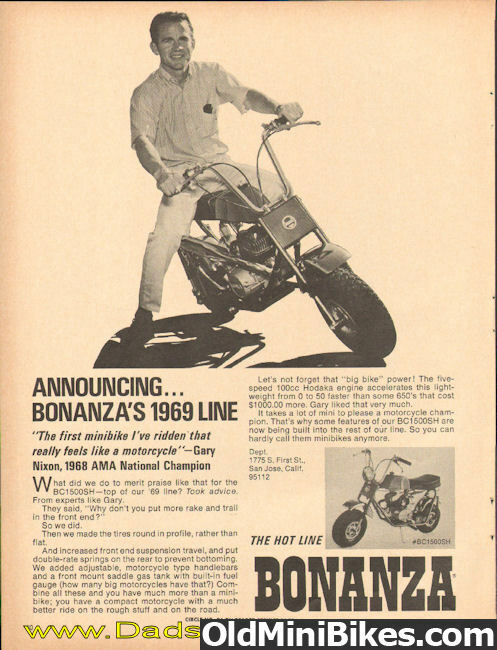 The earlier hodaka bonanzas with the under seat chrome tank were introduced in 1966 and came out in '67 with an ace 90 and with an ace 100 in '68. In '69 they discontinued the bc1300sh with the hodaka and introduced the bc1500sh with an ace 100 and the fiberglass tank. . You can get ethonal free gas, line the tank or just drain the tank when your done. Yup..... very nice. From Salem Oregon would be quite a cross country ride back to Florida. Wow.... the 3/4 inch jackshaft brings back memories ! I had a new 1969 BC 1500 SH that I bent (2) 5/8 inch jackshafts on, then my dad had a 3/4 inch jackshaft made up for me. No more bent jackshafts.